This is the Covert 9 Million Volt Stun Gun Flashlight by Stun Master. This stun flashlight has hidden probes so it looks just like an ordinary flashlight, but it's really a stun gun packing 9 million volts of electrified stopping power. This makes a great self defense tool for anybody. 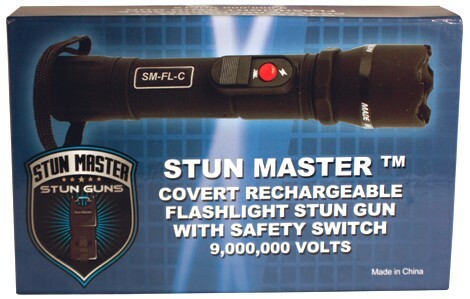 The Stun Master Covert Flashlight Stun Gun is rechargeable, so you won't ever need to buy batteries. It's able to be recharged by using the included wall charger, and also can be charged in your car by using the cigarette lighter adapter. The Covert Stun Gun Flashlight has a rubberized coating for a firm grip and better handling. It also includes a wrist strap. Dimensions: 7 1/4" x 1 1/2"
When you test fire a stun gun in the air, you will hear a loud crackling noise. This unit in particular makes a very loud sound. However when you are actually using a stun gun on an attacker, you won't hear any noise at all. The current is being dumped into their bodies, and there is no noise. This is important to know because most people use stun guns in an emergency situation, and if there's no noise then you might think the stun gun isn't working. You will definitely know by your attackers reaction if the stun gun is working properly, but it's very important to make sure that you have a reliable stun gun if you want to have the best chance of staying safe. We only carry self defense products that we know are high quality and that we can back up with personal experience. Over the years, Stun Master has proven to us that they are a great company with awesome products you can count on when you need it the most.